I started my walk of at the Weaver estuary this morning and the sickening sight of a Rabbit blinded by myxomatosis and sat forlornly in the lane before stumbling into the undergrowth (it would be quicker if a predator finished it swiftly. There were 5 Great Crested Grebe on the Manchester Ship Canal with an additional pair further up the river. Ducks included: Tufted Duck, Common Teal, Mallard, Common Shelduck, Common Pochard and Goldeneye being noted. A group of Mute Swan flew east along the ship canal and 7 more were on the river. The long staying female Red-breasted Merganser reappeared and small number of Black-tailed Godwit made their way out to the estuary to join the hundreds of Curlew, Cormorant, Canada Goose and Common Shelduck out there. A pair of Stonechat were in the reed bed and a Kestrel was disturbed and took off clutching a small rodent. A Sparrowhawk flew low over the tank flushing a couple of Common Snipe on its way. While PR was checking out the east end of the marshes I was hiking west along Lordship Lane where the shrinking violet of a herd of Whooper Swan were hiding behind the hedges close to Hillview Farm. The four Eurasian White-fronted Goose were still present in fields on Ince Marsh fields (west of the Holpool Gutter) and best viewable from the track adjacent to GrowHow Works. Also with them was a Greylag Goose and several Mute Swan. Walking along the lane at dawn was rewarded with 100’s of Pink-footed Goose skeins heading south (presumably) to spend the rest of the day out on the Dee marshes and surrounding fields. Frodsham Score salt marsh was covered in Canada Goose with 100’s of Wigeon disturbed by the ebbing tide. Also on the move were several thousand Dunlin. A Great White and 7 Little Egret were about the area. The injured Whooper Swan was sat on the banks between the salt marsh and the ship canal. No.6 tank had a return to form with 1100 Common Teal taking advantage of the flooded daisy beds to conceal themselves. Whenever anyone’s head broke the skyline along the path they rose into the air circling before resuming their feeding pattern. A few Shoveler, Gadwall and Pintail attempted to make up the rest. A Marsh Harrier put in its final appearance of the year. …and one for Roger Wilkinson, an Earthstar fungi at Weston village at dusk today. At this point we would like to wish all our readers some great visits or reports from these posts in 2019. Observer: WSM (images and video 1 & 2-8 & 10-11). A quick look over the Mute Swan herd this morning and the 4 Russian White-fronted Goose were still grazing with them. A lone Pink-footed Goose must be an injured bird because it hasn’t move away from this field for days now. A skein of more mobile Pink-footed Goose passed overhead moving south. Observer: Paul Ralston ( all images). A little credit where credit is due and in Paul’s case not solicited for. Below are a few images he took yesterday at Shotwich boating lake, Flintshire, CH5 2LL and just across the Welsh border from Cheshire. A Black Redstart he found and a family group of Bewick’s Swan at this location. I was out and about round No.6 tank for a walk as far as the Holpool Gutter this morning. As usual there was plenty of Common Teal but not much else apart from a dozen Shoveler. The Raven hoard were still feasting on the dead sheep mutton laying on No.3 where 4 Common Snipe wading in the shallow waters. An opportunistic Sparrowhawk snatched a Goldfinch out of the charm bracelet of finches. Other raptors namely, 3 Common Buzzard were sat on the fence posts bordering No.3 an old disused sludge tank. Along the Manchester Ship Canal path and a look over Frodsham Score salt marsh where a few thousand Canada Goose were grazing with the mixed plover flocks resting nearby. A single Great Crested Grebe and 15 Tufted Duck were on the ship canal. A look through the Mute Swan herd alongside the Holpool Gutter fields included 28 with the four Russian White-fronted Goose back grazing alongside the swans. Walking back along the path between No.6 and No.4 and a Brambling popped out of the Chaffinch flock, which held several Reed Buntings. The Whooper Swan herd has moved a couple of fields towards Rake Lane and are a great daily addition to birding on these marshes. My walk to Marsh Farm was pretty uneventful apart from a pair of Stonechat on the pipes that run through No.1 tank. After all that excitement I rallied round and took a hike around the ‘bend’ and the Weaver estuary where 147 Tufted Duck were present on the River Weaver with 12 Common Pochard, 120 Common Teal, 5 Goldeneye (1 drake), 700 Canada Goose, 6 Little and 12 Great Crested Grebe. A Common Sandpiper secreted itself into a big herd of Canada Goose. No.6 tank beckoned next but on arrival there was literally nothing to see (a vacant void) after a long wait a flock of 28 Shoveler and 2 Common Shelduck dropped in. A look across the marshes and in the distance the incoming tide was dislodging the shorebirds from the salt marshes. The impressive swarms of c30,000 Dunlin were again outstanding with c800 Golden Plover and c1000 Lapwing. A large skein of c300 Pink-footed Goose headed in from the south and alighted on Frodsham Score. The Whooper Swan herd continues to winter on the farm fields of Lordship Marsh, per Jacqui & Idris Roberts. A ringtail Hen Harrier was back after a short absence per Ruby Merriman. I started my walk along the Weaver Bend this morning where 18 Mute Swan were on the river and a young swan lay dead on the bank. Ducks included Common Teal, Mallard, Tufted Duck and Gadwall were all noted with several Little Grebe and a single Great Crested Grebe. A Marsh Harrier was sat in the reed bed and 2 Common Buzzard were perched in the trees on the banks of No.6 tank. A Sparrowhawk flew low over No.3 spooking a large flock of Starling. The ‘phalarope pool’ on No.3 held Common Teal and Shoveler and then a flock of 20 Black-tailed Godwit dropped in to feed alongside them. On to the Manchester Ship Canal path and a flock of c100 Stock Dove flew off Frodsham Score salt marsh when a Common Buzzard cruised by. The Lapwing and Golden Plover flocks were still settled and enjoying the peace and quiet as the shooters were targeting pheasant and pigeon elsewhere on the marshes. The remains of another dead swan were on the bank of the Holpool Gutter while the herd of 27 Mute Swan were back on their wintering field with a single Pink-footed Goose for companionship. Walking back along Lordship Lane a skein of Pink-footed Goose flew high heading south. Not much activity along Lordship Marsh as shooting was taking place with the Curlew flock moving between the fields. I stopped off at Plover Lane on my way home and could see the Whooper Swan herd grazing on Lordship Marsh in the distance. Observer: Paul Ralston (images 1-6). A good old-fashioned post-Christmas walk along the track between No.6 and No.5 tanks in what at times felt like Springtime. The Common Teal flock on No.6 were much reduced than on my previous visits and similarly the Shoveler flock was reduced down to 23 birds. 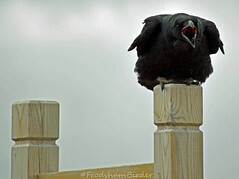 Another dead sheep on No.3 attracted c35 Raven with one particular corpse laying close by for some images to be taken. My visit coincided with a high tide on the River Mersey and small flocks of both Lapwing, Golden Plover and Dunlin slowly gained in numbers. The plovers reached a thousand birds and the Dunlin in a mind-blowing serpentine line breaking into c30,000 birds. The flooding tide brought out 3 Great White and several more Little Egret. An injured Whooper Swan was riding the incoming tide, while two other birds included one odd adult with a swollen base to its (mostly) black bill? Wigeon were the most numerous ducks but sensibly kept close to the river’s edge. The Ince Marsh fields still had PR’s Mute herd and single Pink-footed Goose. The reed beds on No.4 tank had a Great Spotted Woodpecker, 2 Cetti’s Warbler, a couple of Chiffchaff and a female Stonechat. Walking back and a female Marsh Harrier dropped in on No.6 tank while the evening mist filled the fields with an eerie shroud. A Peregrine roosted on one of the pylons by the M56 to be the last bird of the night. Observers: Sparky & WSM (images 7-11). I took advantage of some time this morning to walk along the track between No.6-5-4 tanks before heading back for the festive binge. The peeling bell-like sounds of Common Teal were ringing out close to the banks of No.6 tank. I carefully popped my head just above the lip of No.6 sludge tank and managed a count of c400 birds. An additional flock of 24 Shoveler were the only other ducks on the water. A Kestrel was unconcerned by my presence on No.5 tank and allowed me enough time to video it. A small skein of Pink-footed Goose flew low over No.3 tank but much larger numbers could be seen in the distance over Frodsham Score. A large gathering of c40 Raven were enjoying the fringe benefits of a dead sheep and were joined for their Xmas lunch by 4 Great Black-backed Gull and a very possessive Common Buzzard, totally enjoyable watching their avian hierarchy in progress. A Cetti’s Warbler gave a brief song from the reed beds on No.4 and a distant Great White and Little Egret appeared from the murk on Frodsham Score salt marsh. My furthest point of my Christmas Day Bird Walk was at the corner of No.6-No.4 where the 25 Whooper Swan herd could just about be discernible through the thick hedgerow close to Hillview Farm on Lordship Marsh. Not enough time for the afternoon tide but sometimes you have to give in to kicking off your slingbacks and bins and loosen that belt for the afternoon. Merry Christmas to all our readers and hopefully you’ll dip in and out of this blog into 2019. Bill Morton (observer, videos and image maker). I was out around No.6 and No.4 tanks this morning. There were several hundred Common Teal on No.6 with Mallard, Shoveler and Gadwall. Numerous Curlew were passing overhead to feed in the fields along Lordship Lane and a flock of 30 Stock Dove were noted. A large flock of Linnet were on the weedy seed heads along with Chaffinch, Reed Bunting and Meadow Pipit finding something with a little more protein. A separate charm of Goldfinch chose No.4 to sate their appetite. I tried hard to locate Whooper Swan herd in the morning fog but only four birds appeared overhead and dropped down on Lordship Marsh in the mist. A female Sparrowhawk was hedge hopping along Lordship Lane. The fields adjacent to the Holpool Gutter had 4 Mute Swan but again no sign of the recent White-fronted Goose flock, but hopefully they will still be in the area. A Kingfisher was seen again speeding along the gutter and typically left a blue flash behind it. All was quiet on the Frodsham Score salt marsh and even the plover flocks were settled and not panicking as they normally do. The rest of the 18 Mute Swan herd were on the Manchester Ship Canal 18 but soon made their way back to the fields. The presumed Nordic Jackdaw continues to be seen on the football fields off Park Road, Runcorn per WSM.